"According to the Jyotir-veda, a lunar eclipse takes place when the Rāhu planet comes in front of the full moon. 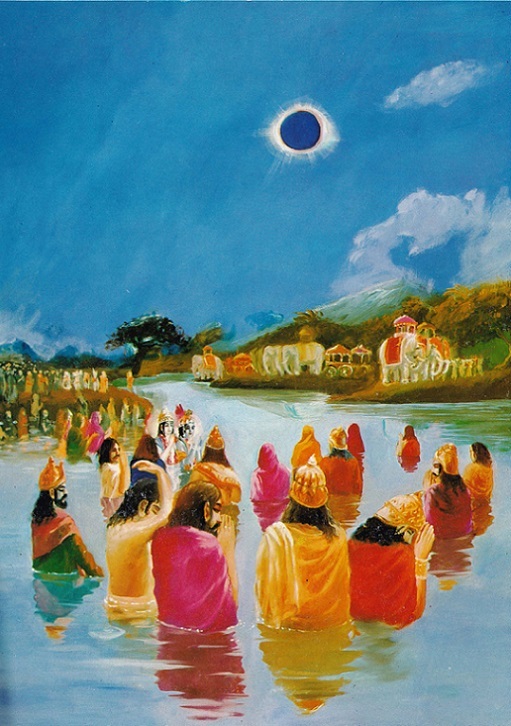 It is customary in India that all the followers of the Vedic scriptures bathe in the Ganges or the sea as soon as there is a lunar or solar eclipse. All strict followers of the Vedic religion stand up in the water throughout the whole period of the eclipse and chant the Hare Kṛṣṇa mahā-mantra." "Even if one distributes ten million cows in charity during an eclipse of the sun, lives at the confluence of the Ganges and Yamunā for millions of years, or gives a mountain of gold in sacrifice to the brāhmaṇas, he does not earn one hundredth part of the merit derived from chanting Hare Kṛṣṇa." "The Supreme Personality of Godhead, Viṣṇu, is always the protector of His devotees, who are also known as demigods. The controlling demigods are most obedient to Lord Viṣṇu, although they also want material sense enjoyment, and that is why they are called demigods, or almost godly. Although Rāhu attempts to attack both the sun and the moon, they are protected by Lord Viṣṇu. Being very afraid of Lord Viṣṇu's cakra, Rāhu cannot stay in front of the sun or moon for more than a muhūrta (forty-eight minutes). The phenomenon that occurs when Rāhu blocks the light of the sun or moon is called an eclipse." "There are always two kinds of men in this universe, not only on this planet but also in higher planetary systems. All the kings dominating planets like the sun and moon also have enemies like Rāhu. It is because of occasional attacks upon the sun and moon by Rāhu that eclipses take place. The fighting between the demons and demigods is perpetual; it cannot be stopped unless intelligent persons from both sides take to Kṛṣṇa consciousness." "The ordinary conditioned human being may think that the conditioned soul, who is covered by his materialistic senses, mind and intelligence, is equal to Kṛṣṇa, but Lord Kṛṣṇa is just like the sun, which, although it sometimes may appear to be so, is never covered by the cloud, snow or fog, or by other planets during an eclipse. When the eyes of less intelligent men are covered by such influences, they think the sun to be invisible. Similarly, persons who are influenced by senses addicted to material enjoyment cannot have a clear vision of the Supreme Personality of Godhead."